Good luck! I’ve enjoyed following your build. Thanks! 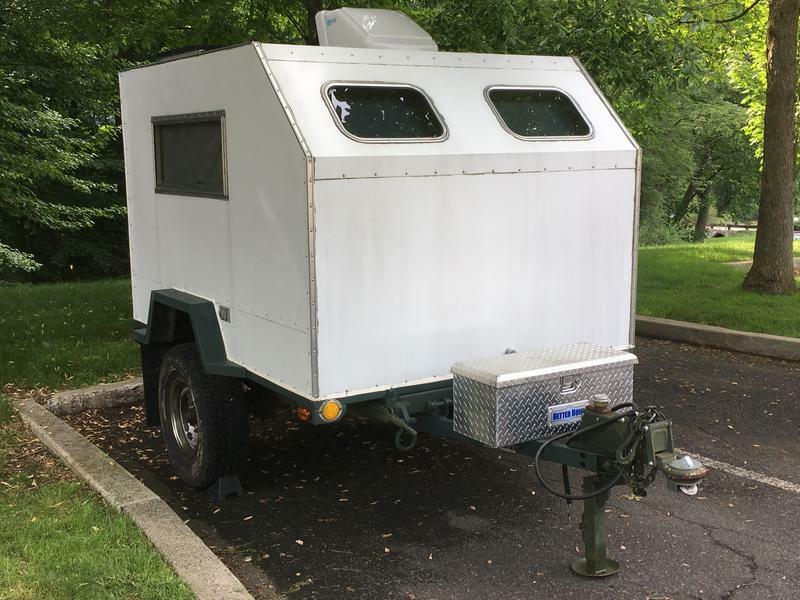 The trailer is still at the shop. They are working on it when thy can in between other jobs, but hopefully I’ll get it back soon. 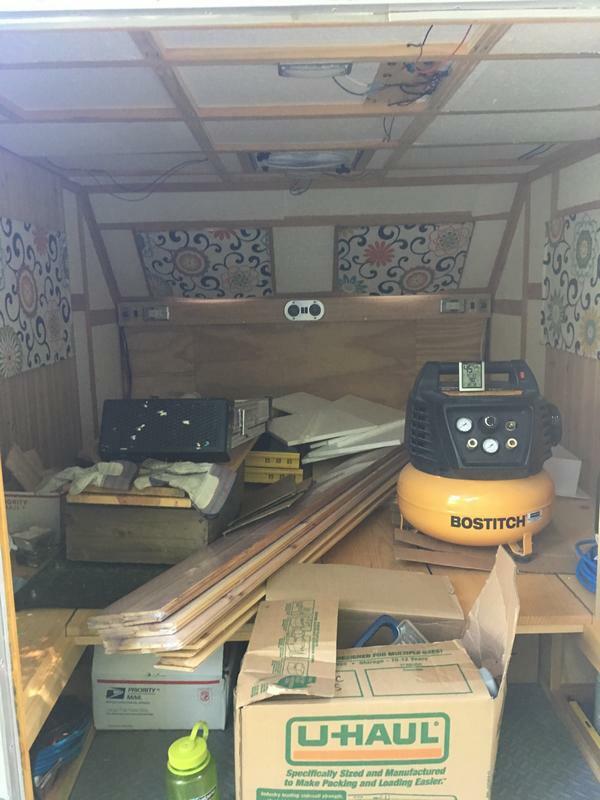 Now that it will be road worthy again, I’m motivated to work on completing the interior. More to come soon. 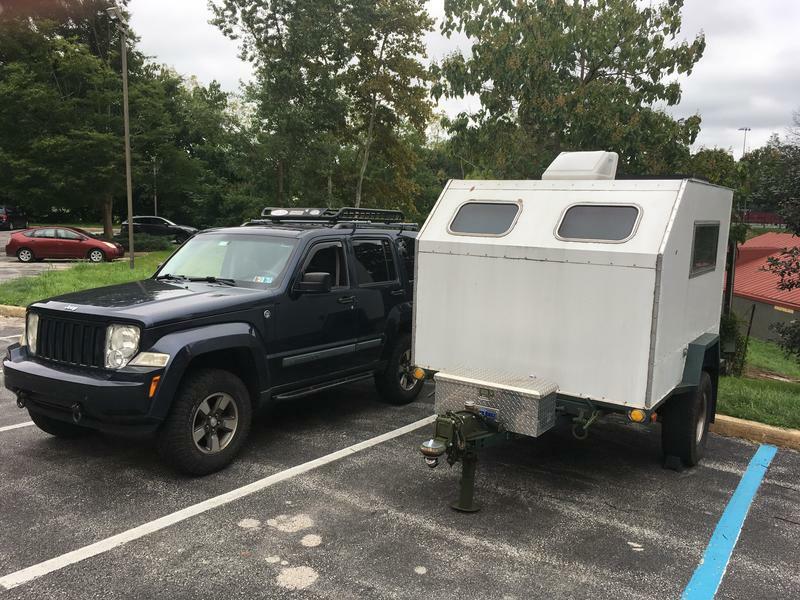 Also, hoping to camp soon somewhere down by the Jersey shore. 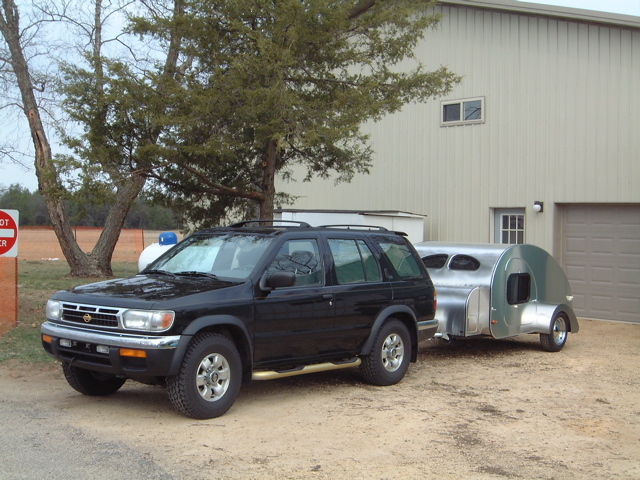 Does anyone have any campgrounds or state parks there that they want to recommend? I was looking at Bass River State Forest as a possibility. 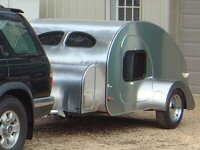 I am trying to decide whether it is worth it to install side cargo doors on my trailer. 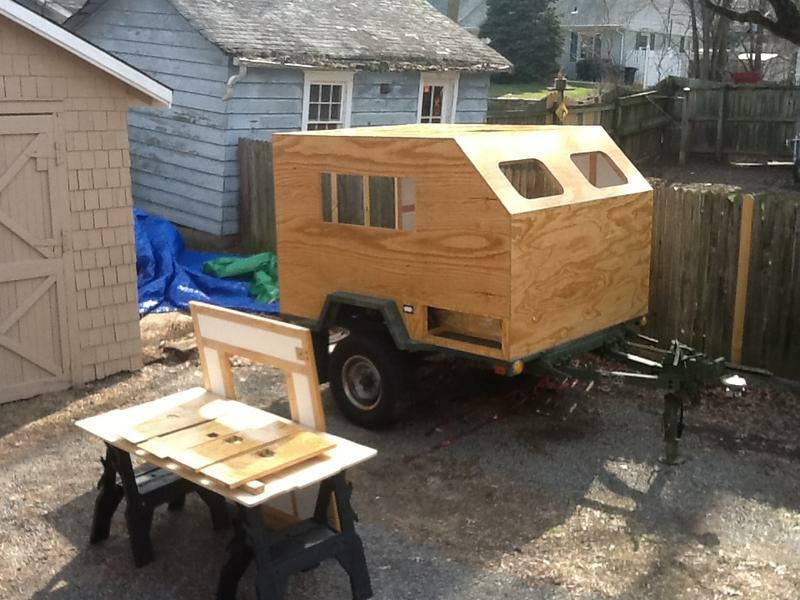 I designed it to have side doors, and I built them, but because of needing to make the trailer campable as soon as possible, I covered over the door openings when I skinned it. 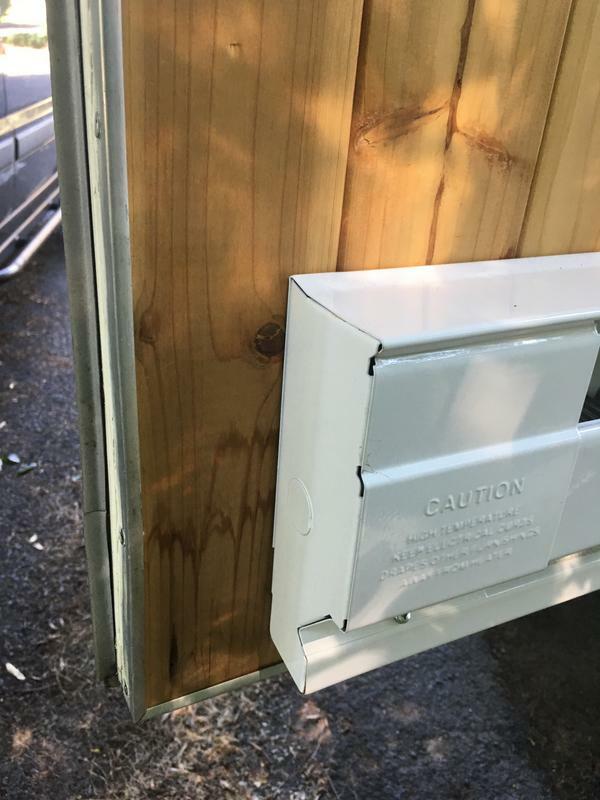 In the last year I moved from one house to another, and so I no longer have spare aluminum to be able to assemble and skin the doors before cutting into the trailer (unfortunately left my spare aluminum at the old house). 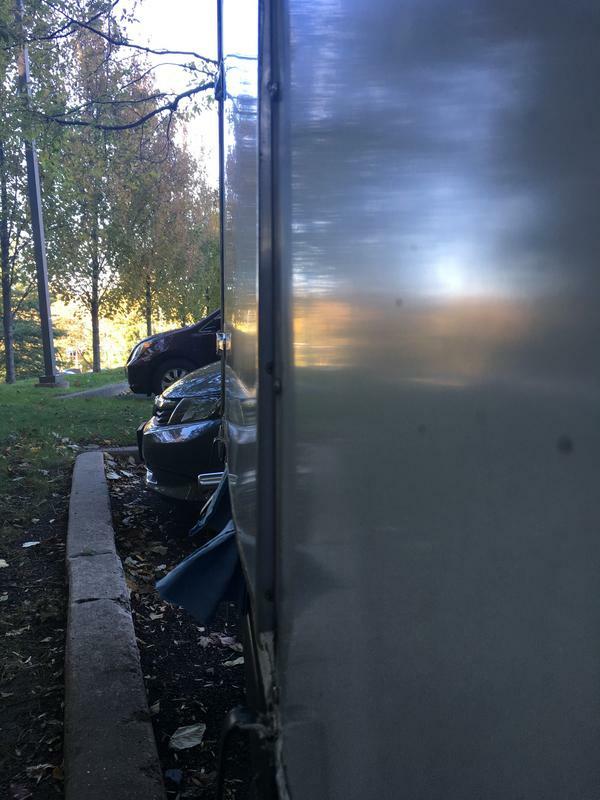 If I were super careful, I imagine I could cut out aluminum rectangles from the trailer sides with my router and a flush cut bit, and then re-use those rectangular pieces of aluminum to skin the doors. However, if I made a mistake and ruined the aluminum, I wouldn't have a matching door skin. I'm also a bit nervous that if I did make doors there, I am introducing a location for potential leaks, where as now things are watertight. So, dear reader, please help me decide! - Have better access to electronics such as the charger, inverter, fuse box, solar charger, etc. - This was the plan all along. 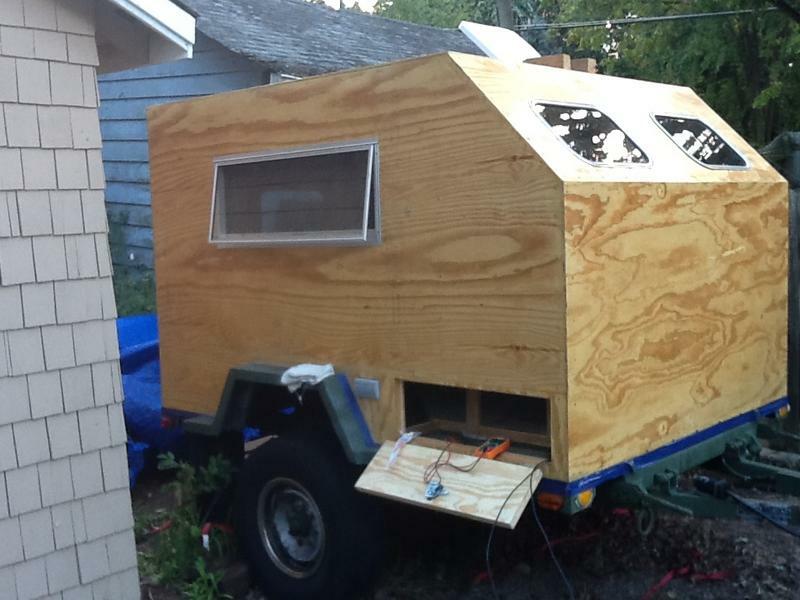 - Could just insulate the door openings inside the trailer and call it good. Because I know I will get more answers to this question in the general discussions area, I also posted it there. Sorry for the double post! Just repaired all of the broken picture links, so that everything works now going back to the beginning of the thread. 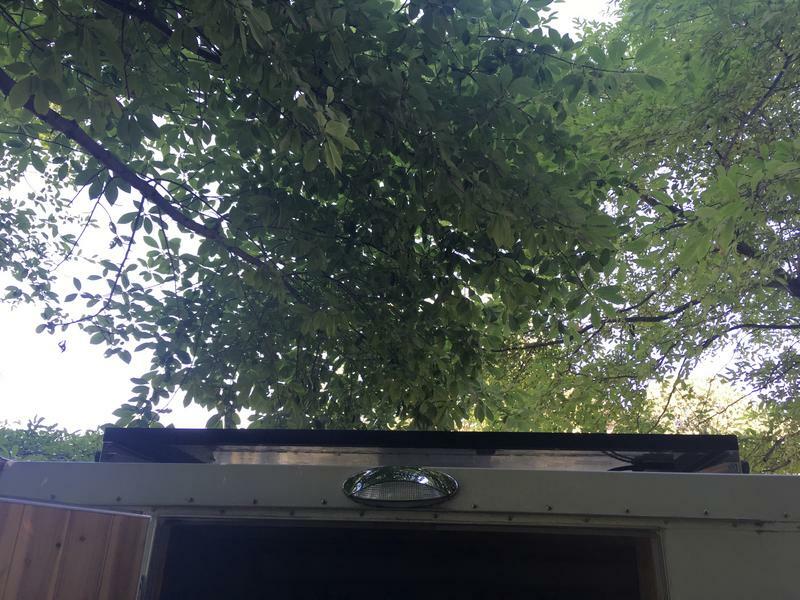 We’ve had some severe rains over the last month here in the mid Atlantic, and my trailer has weathered the storms outdoors because I don’t have a garage. 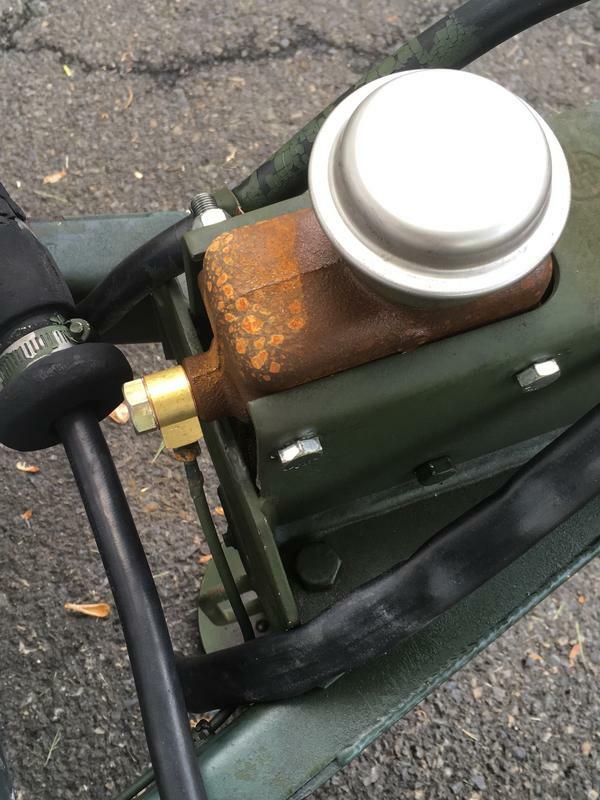 I was inspecting it today and noticed that the seals around my rear door had leaked. I didn’t see any standing water at the time I looked, but I noticed new water stains on the cedar paneling at the bottom inside of the door. 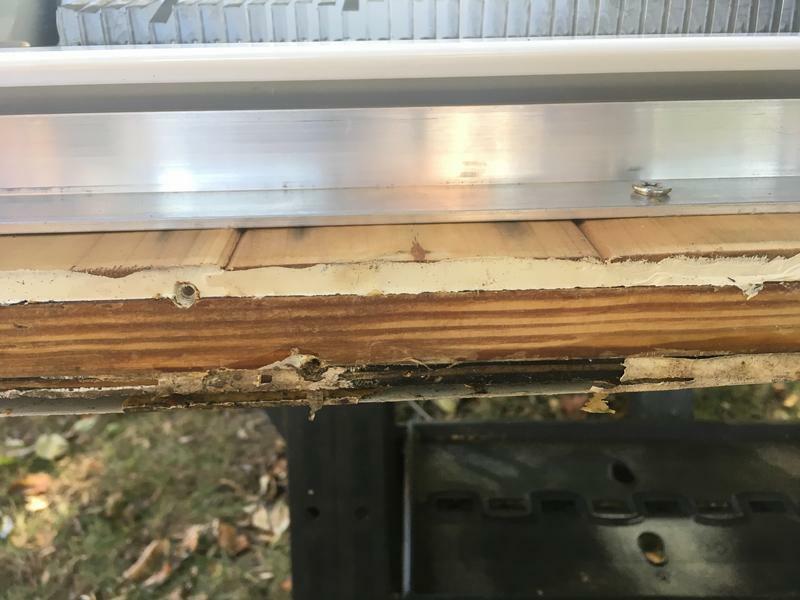 Additionally, the bottom of the door is sticking against the frame when opening and closing it, indicating that it absorbed water and the wood expanded slightly. 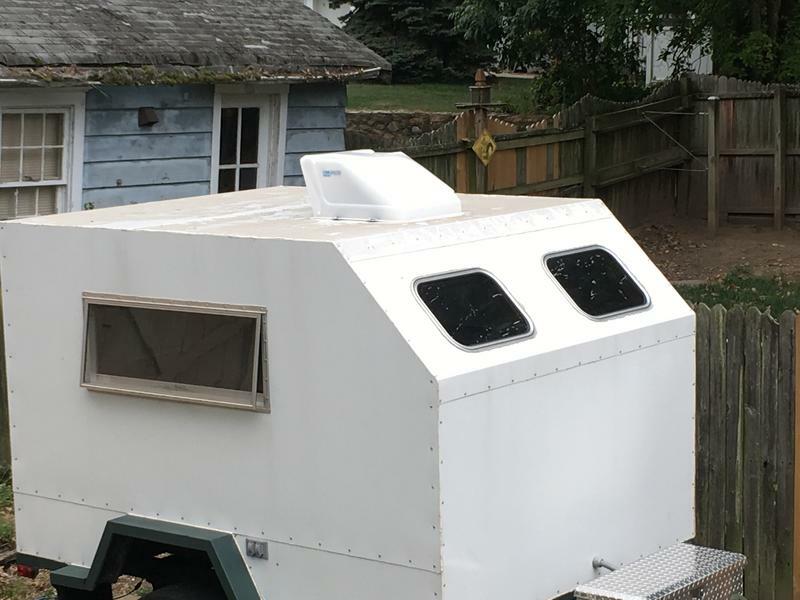 I put a dehumidifier (the water absorbent bead kind) in the trailer to remove some of the humidity and hopefully begin the shrink the door back to its original non-sticking width. Hope it works! If you recall in my previous post I had a sticking door. The reason for that was expansion of the door wood due to a small leak. You can see the staining on the bottom of the door. I went around the door looking for leaks. I suspected a gap at the top of the door, but there wasn’t one, and accordingly there was no staining of the wood up there. 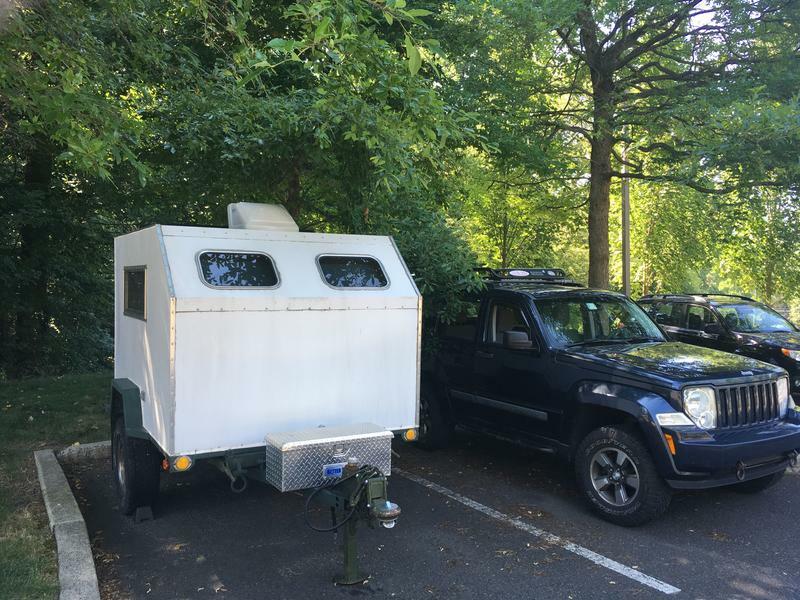 It's been a while since my last post, but I've had two opportunities to use the trailer on short business-related camping trips since then. The door leak is still present but today I made a small bit of progress towards fixing that. 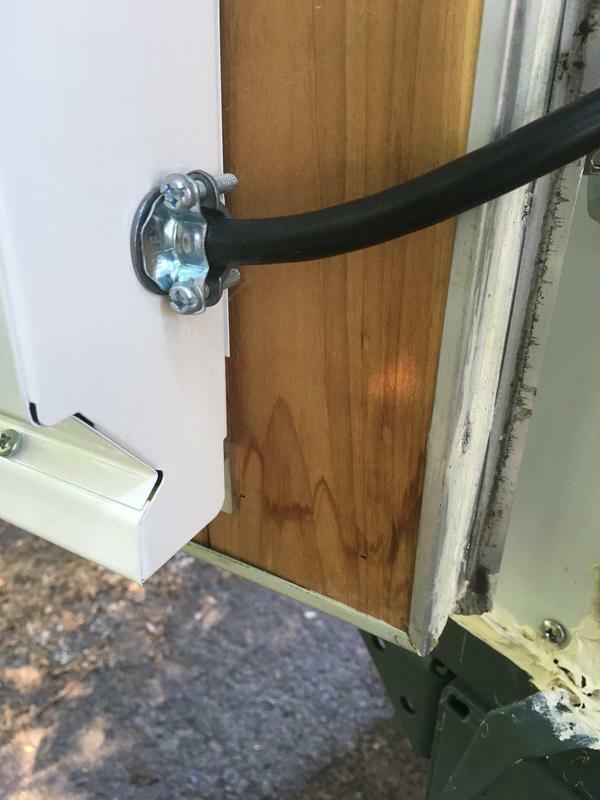 In order to seal the door better, I need to make hinge spacers that hold the door out a little more from the trailer body, to give more room for better insulation to fit in the gap. I have 3/16" thick plexiglass as hinge spacers now. 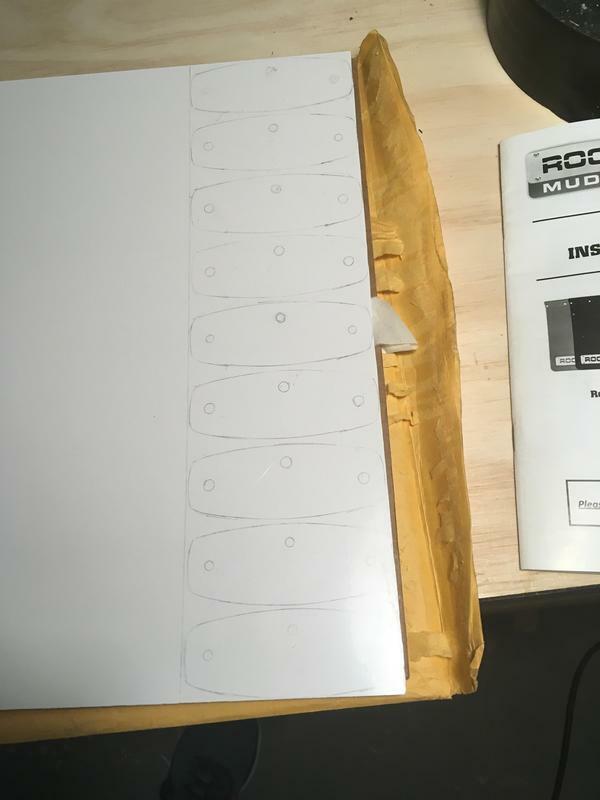 So, I got 1/8" ABS plastic and today I traced out new spacers. I made a few extras because I may eventually install the two cargo doors on the sides of the trailer, and there are 2 hinges on each. This is the type of door weather seal I bought. It's taller than the foam tape I used initially so I should get a better seal. It's also squishier because of the D-shape it has in cross section. I've had good luck with the D-shape weather stripping. S. Heisley wrote: :thumbsup: I've had good luck with the D-shape weather stripping. Oh, that's good to hear! I have had middling luck with the rectangular, solid foam tape weatherstripping I used initially because it doesn't squish very much. My back door is so large that the gap thickness varies (and changes with the humidity), so sometimes it leaks. This is particularly a problem when driving in the rain. 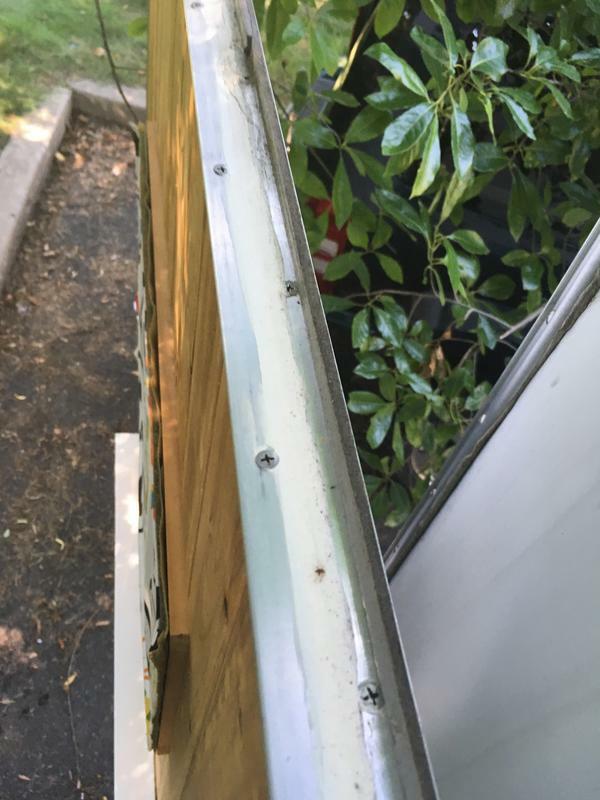 I am optimistic that the D-shaped weatherstripping will fill the gap all the way around. 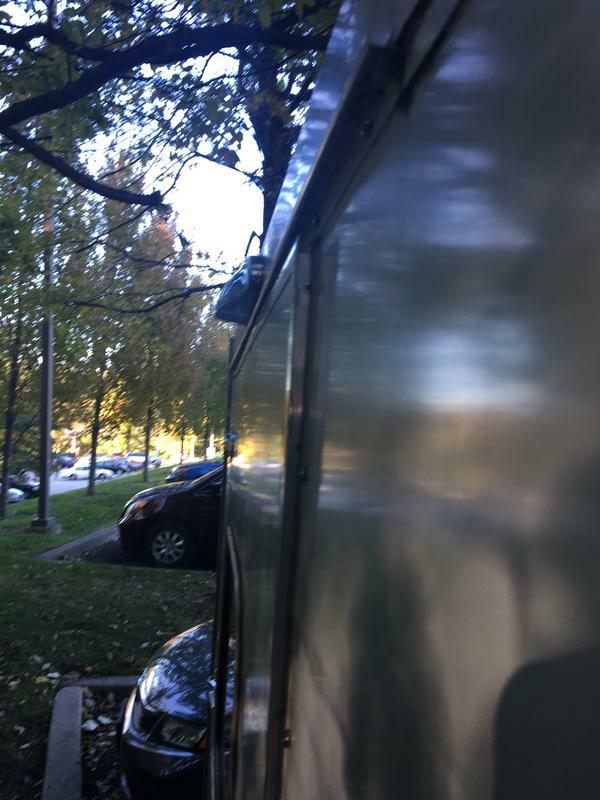 I needed to move my trailer to a different lot today, so here is a current photo. 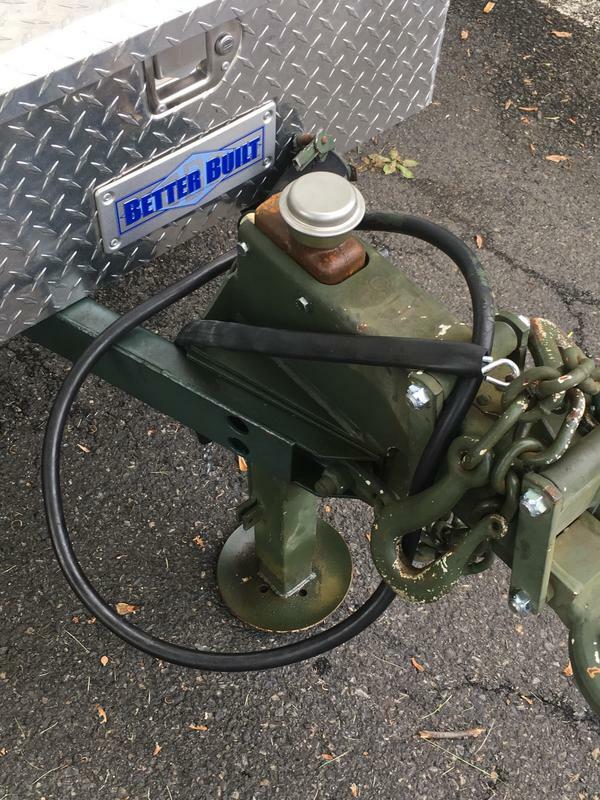 I have the trailer plugged into shore power this weekend to run the baseboard heater and rid my trailer of humidity. After the door shrinks back to normal size (It had gotten wet and expanded), I will redo the weather seals. Hopefully the rain holds off until I can finish the repairs. 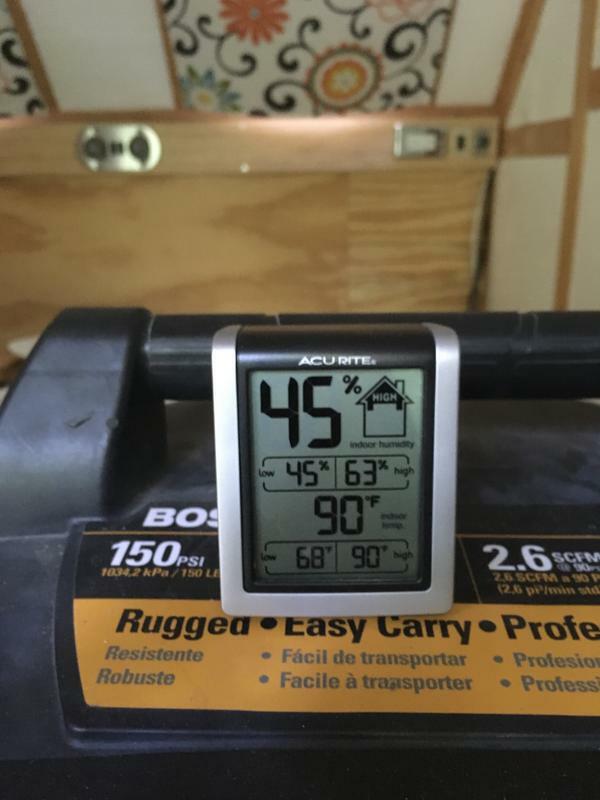 It’s been drizzle and fog for the last two days but the inside of the trailer now registers 99°F and 35% humidity. I have the windows and fantastic fan cover cracked open just a bit so there is airflow via convection. When I turned the heater on, it was something like 75% humidity. The door is no longer sticking, so it is returning to its normal size. 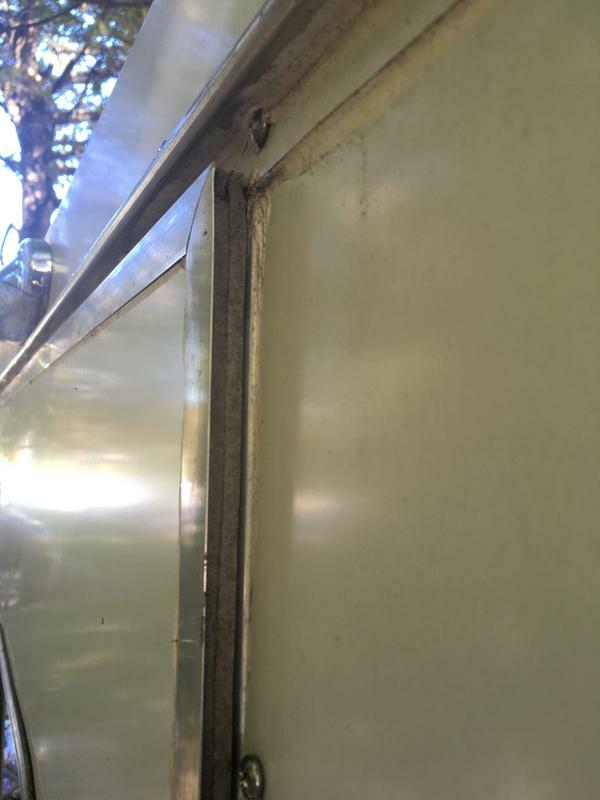 Good weather for re-sealing the door’s T-moldings with sikaflex and installing new weatherstripping may be a few days off yet. Today I took the door off to assess the damage and clean it up so that it can be re-sealed. I found water and some mold at the bottom of the door itself. Luckily the wood is still solid, but it looks like it’s been this way for months. I took the aluminum T molding off the bottom of the door, stripped old caulk off, and disinfected with alcohol. I have the door skin propped away from the wood to let it breathe and help it dry out. 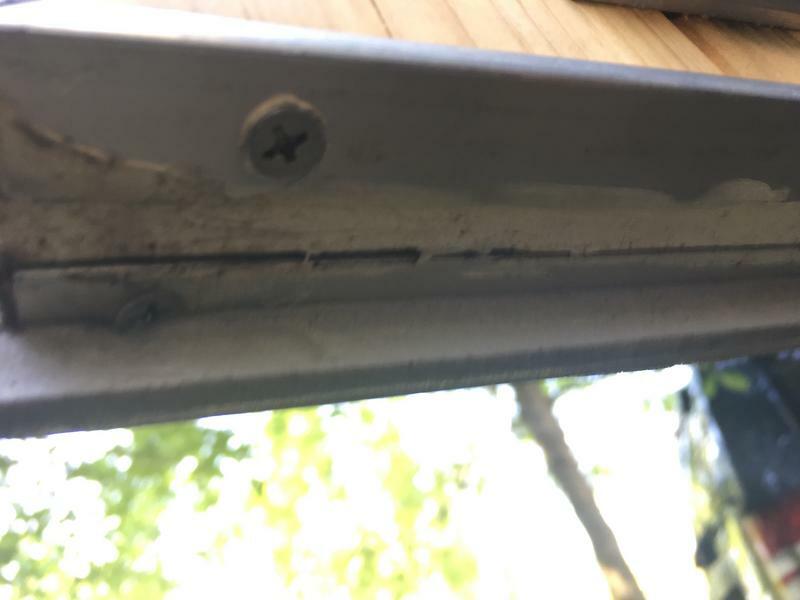 Old weatherstripping. Notice how the door bows outwards at the top. 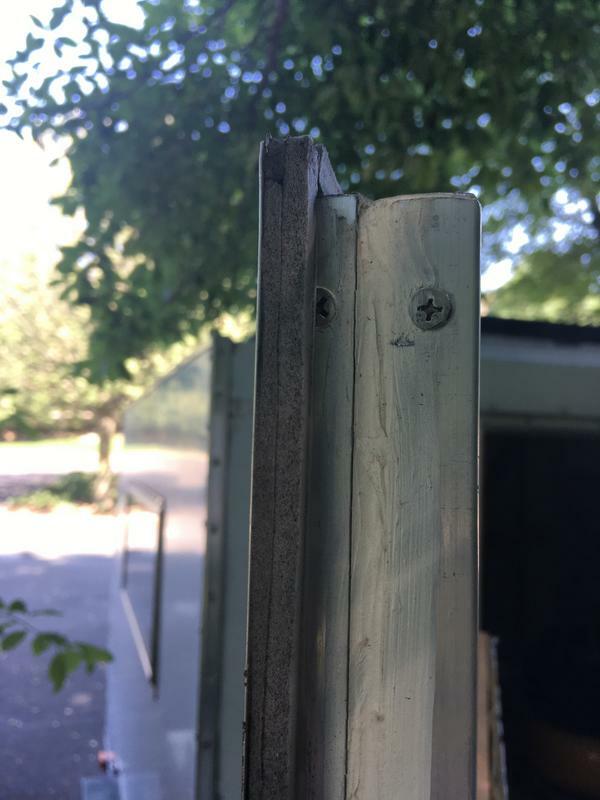 The gap is 1/2”. Water got in here and entered the door itself through cracks in the sikaflex caulk. 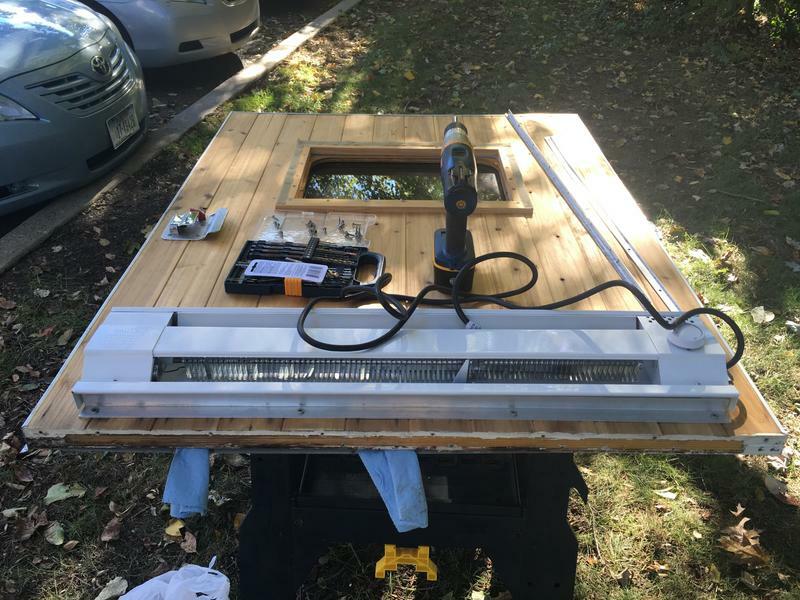 Door off. 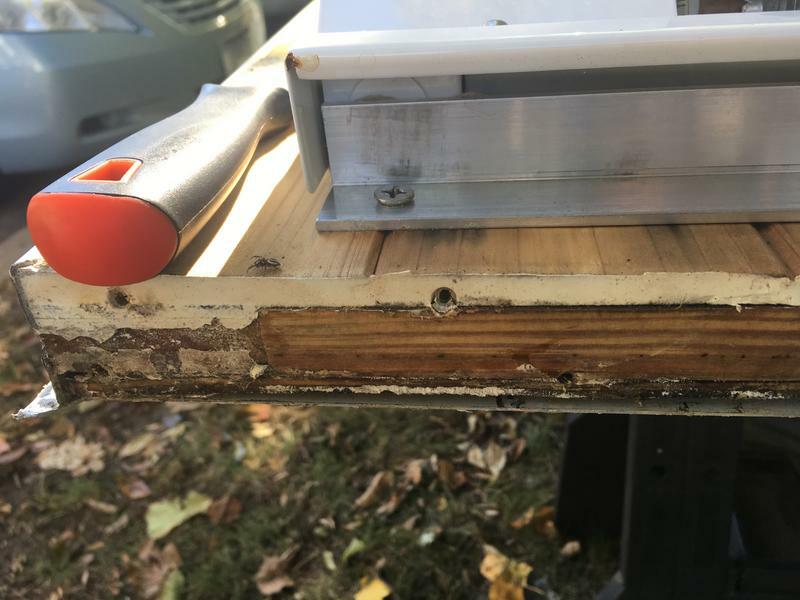 I took apart the bottom of the door where water had gotten wicked in by capillary action through some small cracks. Water damage. It looks worse than it is. There is little or no rot, just saturation and some opportunistic mold. 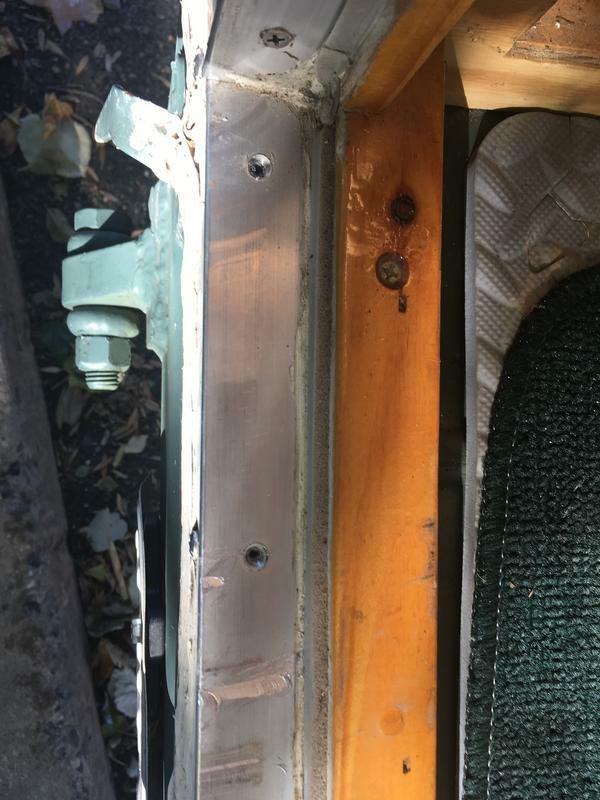 I removed some screws to check for infiltration in the door sill on the trailer. The door sill is not damaged nor even wet. That’s a win! I ran out of time so I put the door back on temporarily sans weatherstripping. It’s still bowed at top and bottom even with the weatherstripping off. Luckily no rain is forecast until Friday. 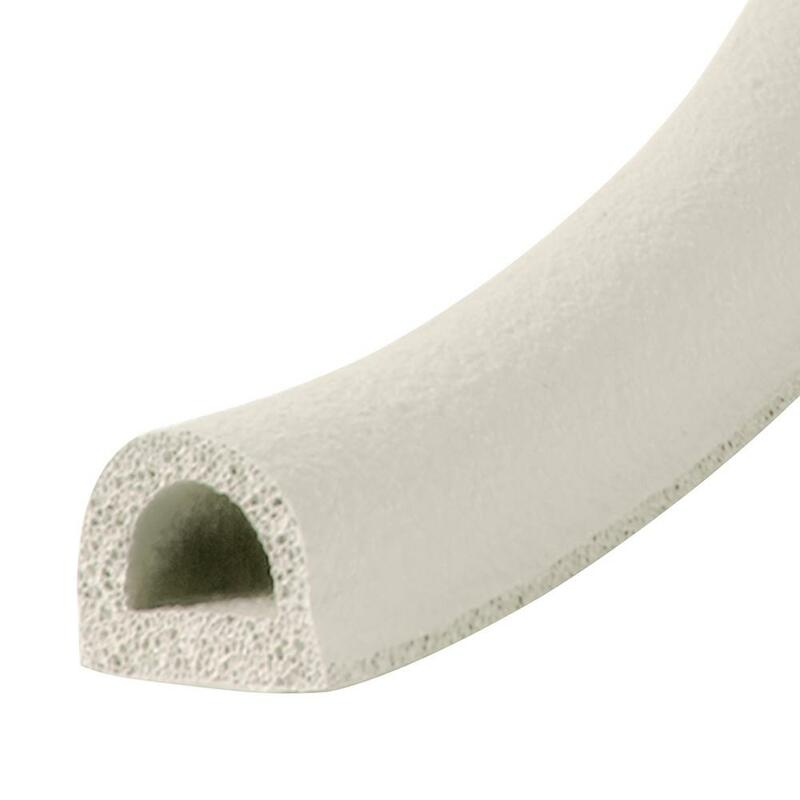 The D-shaped foam tape I got before is only 1/4” tall so it isn’t going to fill the gaps. 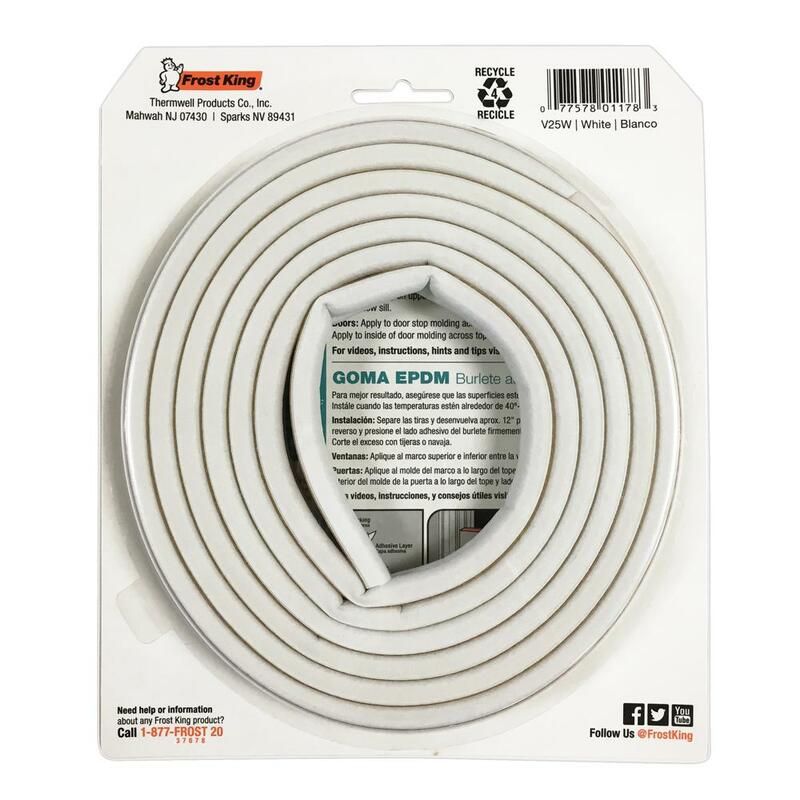 I got some 1/2” tall foam tape that supposedly can compress down to 3/8” in the narrow spots. 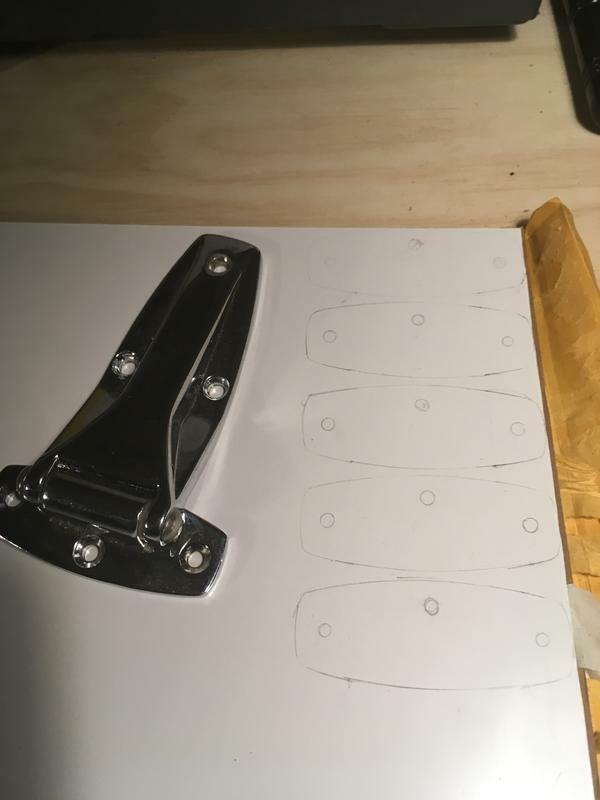 I also made new hinge spacers to create at least a 3/8” space for the new foam. More to come tomorrow and Thursday as I rebuild and reseal the door.